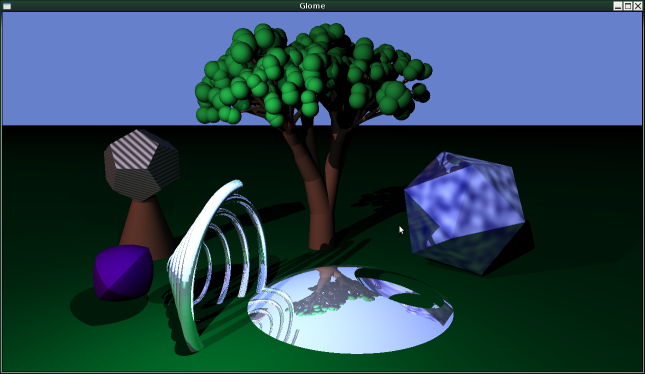 Glome is a ray tracer written by Jim Snow. Originally it was written in Ocaml, but the more recent versions are written in Haskell. Glome consists of the vector library GlomeVec, the ray tracing library GlomeTrace and an application called GlomeView. GlomeView renders into an SDL window, and thus requires SDL. 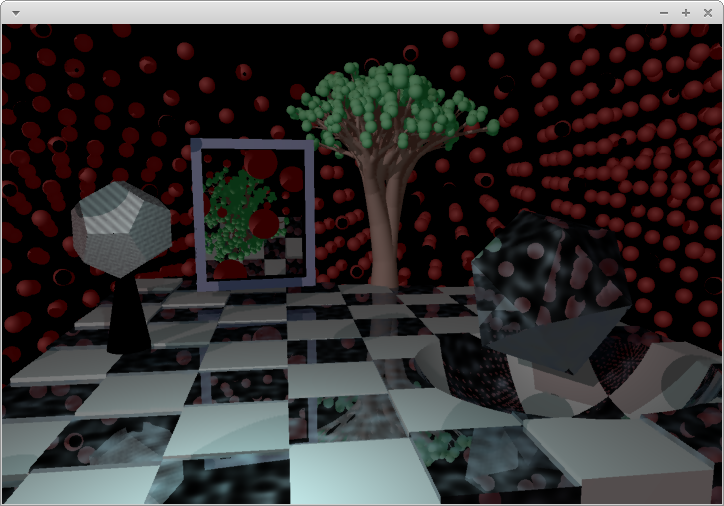 The ray tracing engine itself, though, has few dependencies. Glome does not have a scene description language of its own (save for a rather rudimentary NFF parser), so the most convenient way to describe a scene is directly in Haskell. One can edit the file TestScene.hs included in GlomeView, then re-compile. Jan 27, 2014: New version of GlomeVec, GlomeTrace, and GlomeView fixing several bugs that caused CSG to render incorrectly. Apr 7, 2014: New version of GloveTrace and GlomeView. Major reorganization of textures, and now objects can be given arbitrary tags that are returned by the ray intersection test. GlomeVec is the vector library used by Glome. Originally, it was part of Glome, but now it is a separate library. It isn't implemented in any particularly clever way, but it has many useful routines for graphics built-in, like transformation matrices. GlomeVec also includes a basic solid texture library. Right now, it has an implementation of perlin noise and a couple of simple textures like stripes. GlomeTrace is a library that provides ray-tracing algorithms and a variety of geometry primitives. Originally, it was part of Glome, but now it is a stand-alone library. Supported base primitives include: sphere, triangle, cone, cylinder, disc, plane, and box. Composite primitives (those which are containers for other primitives) include groups, csg differenc and intersection, transformed instances, textured objects, and bounding objects. In addition, there is an implementation of the BIH acceleration structure, which automatically builds a bounding volume hierarchy around unsorted lists of primitives. This greatly improves the performance for large scenes. GlomeTrace depends on GlomeVec, but it doesn't have any other unusual dependencies. Send any questions to the author: jsnow@cs.pdx.edu In particular, I'd like to know if the test image is failing to render on you platform, or if it is failing to build. These are some successful open-source ray tracers. They're worth looking at for anyone interested in writing their own. POV-Ray - fairly slow, high-quality renderer with many features. This is the renderer that has had the most influence on the design of Glome. Arauna - high performance renderer used for realtime games, faster than Glome by two or three orders of magnitude. PBRT - topic of an excellent book on ray tracing. This page was last modified on 11 April 2014, at 19:46.